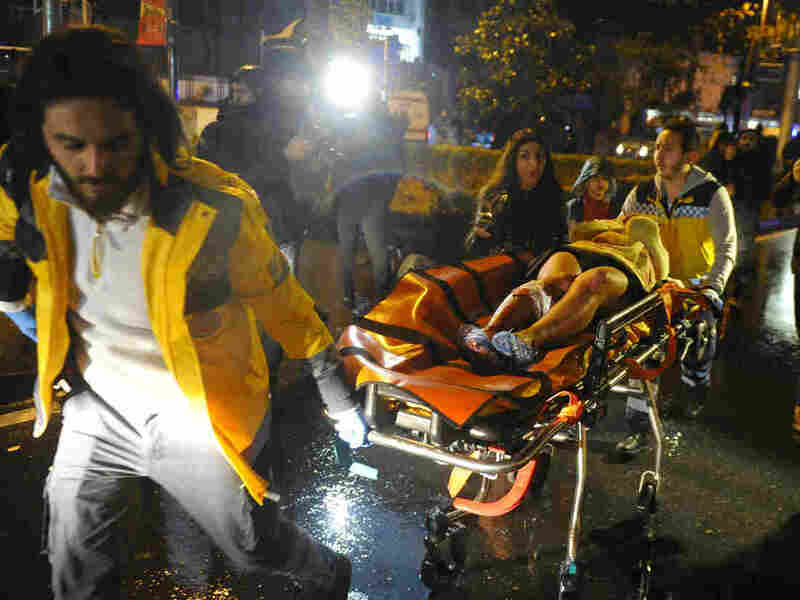 Istanbul, Turkey, Nightclub 'Terror Attack': At Least 39 Dead, 69 Wounded : The Two-Way A gunman opened fire during New Year's celebrations at a club in Istanbul, in what the city's governor called a terror attack. At least 39 people were killed and dozens more were wounded. First aid officers carry an injured woman at the site of an armed attack on Sunday in Istanbul. At least 39 people were killed in an armed attack Saturday on an Istanbul nightclub where people were celebrating the new year. At least 39 people were killed and 69 others wounded during New Year's celebrations Saturday after a gunman opened fire at an Istanbul nightclub. At least 16 of those killed were foreign nationals. Interior Minister Suleyman Soylu told reporters that the attacker entered the Reina nightclub and began shooting at random, NPR's Peter Kenyon tells our newscast. The killer then changed clothes and left, says the minister. Turkish anti-riot police officers stand guard at the site of an armed attack on Sunday in Istanbul. The manhunt for the attacker, who has not yet been identified, is still underway, Soylu adds, as police believe he carried out the attack alone. Provincial Gov. Vasip Sahin has described the incident as a terrorist attack. "A terrorist with a long-range weapon ... brutally and savagely carried out this incident by firing bullets on innocent people who were there solely to celebrate the New Year and have fun," Sahin told reporters. At Reina, one of the city's most popular nightclubs, it's believed some 500 to 600 revelers were celebrating the start of the new year. Reuters reports that the attacker shot at a police officer and at civilians before entering the nightclub. Many inside were said to have jumped into the neighboring Bosphorus waterway in an attempt to save themselves from the gunfire. A Turkish cabinet minister told the state-run Anatolia News Agency that citizens of Saudi Arabia, Morocco, Libya and Lebanon are among the dead, Peter reports. In addition, the Israeli Foreign Ministry says a young Arab-Israeli woman was killed in the attack. Peter adds: "The interior minister named several possible culprits, including Islamic State, Kurdish militants or far-left groups." According to the Associated Press, several ambulances and police vehicles were dispatched to the scene, an area described as "on the shore of the Bosphorus Strait in the Ortakoy district." The cosmopolitan neighborhood is home to many clubs, restaurants and art galleries. 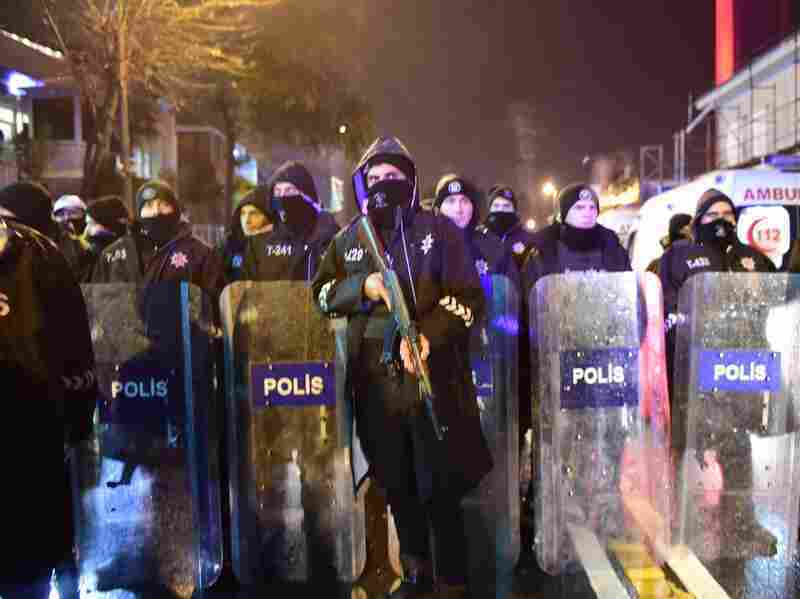 "Security measures had been heightened in major Turkish cities, with police barring traffic leading up to key squares in Istanbul and the capital Ankara. In Istanbul, 17,000 police officers were put on duty, some camouflaged as Santa Claus and others as street vendors, state news agency Anadolu reported." This latest attack comes just two weeks after Russian ambassador, Andrei Karlov, was shot dead by off-duty Turkish policeman Mevlut Mert Altintas and three weeks after a bomb attack killed 44 people at a football stadium in Istanbul. A Kurdish militant group claimed responsibility for the latter. Turkey, which is part of the U.S.-led coalition against Islamic State, has faced numerous security threats. In all, there were at least six attacks in Turkey in 2016, claiming more than 200 lives. Meantime, the White House is condemning the attack, calling it a "horrific terrorist attack" and offering to assist Turkey. According to the AP, White House spokesman Eric Schultz says President Obama — who is vacationing with his family in Hawaii — "was briefed on the attack by his national security team and asked to be updated as the situation develops." "White House National Security Council spokesman Ned Price says the attack on 'innocent revelers' celebrating New Year's shows the attackers' savagery. He says the U.S. sends thoughts and prayers to the relatives of those killed. "Price says the U.S. supports its NATO ally Turkey as both countries fight terrorism." "It was a horrible year," journalist Mustafa Akyol told NPR's Ailsa Chang on Sunday morning. "We had a bloody coup attempt ... almost 300 people were killed, then a very brutal crackdown began after that and thousands of people found themselves in jail with, I think, exaggerated charges in my view — at least some of them. "Then, the terror attacks, both the PKK — which is a Kurdist, separatist group with a left-wing secular ideology, and ISIS. They both organized major attacks inside Turkey." Akyol's latest column, published just hours before the attack, enumerated the many tragic events of 2016, calling it Turkey's "worst year ever." "And you know what is the worst?" he writes. "There is no guarantee that the future will be any better. There is no assurance that all this will prove to be a temporary crisis rather than the new normal." "What we need at this time is not more conspiracy theories," Akyol told NPR. "Not a more authoritarian government. But really, national unity based on understanding and tolerance and reconciliation. We're not there though, unfortunately yet."